So what exactly is litslash, you ask? Easy. Slashy fanfic stories inspired by books instead of tv shows or movies. 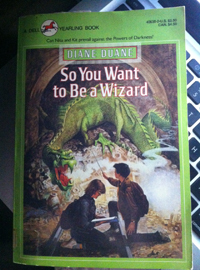 The book covers shown are the ones I knew the very first time I read these books. 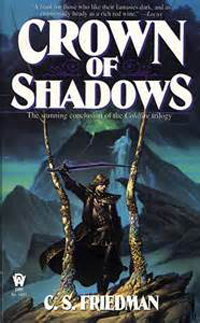 This is a story based on Crown of Shadows, by C. S. Friedman. This is the third book of the Coldfire Trilogy, and I'm reasonably sure it'll make no sense whatsoever if you haven't read the books. 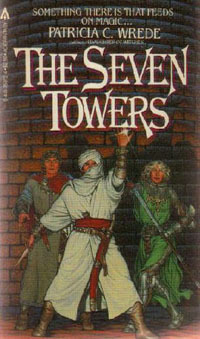 This is a story based on The Seven Towers, by Patricia C. Wrede. It may or may not make sense if you haven't read the book, I'm not sure. This takes place shortly after the Host's triumphant return from the defeat of the Horde. 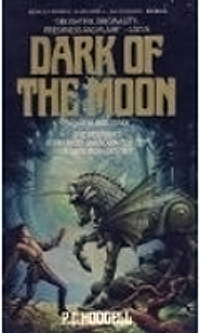 (End of Dark of the Moon.) Torisen, Highlord of the Kencyrath, has returned to his home keep of Gothregor. His long-lost twin sister Jame is causing an uproar with her improper ways. However, Jame's behavior fades to insignificance in comparison to the news she brings her brother. Torisen finds himself in a hideously uncomfortable position, forced to rethink the habits of a lifetime. Jame finds herself at loose ends upon arrival at her brother's keep. A whole new world opens out before the Black Lord. At what price does happiness come? Perhaps too high, when the cost is one's honor. "An ill wind blows no good," as the old aunties say, and an evil wind indeed is blowing down from the North. What shall the future bring? Torisen must learn to accept himself before he can find out.